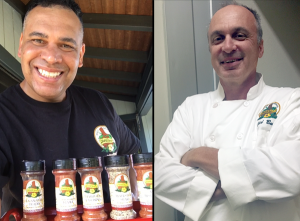 These two guys want to make 2019 the year of Hawaiian spice and seasoning so you and your family can enjoy the flavor. Greg “Bonz” Heath the shuttle driver and Mark Givensel, the I.T. guy met at work and discovered they had a lot in common. Unknowingly to many Greg “Bonz” Heath is an award winning chef and owner of Lahaina Spice Company which he started out of his garage a few years ago. In addition to fixing computers, Mark Givensel also has a love for building websites and selling products online. After trying a few of the amazing Hawaiian spice and seasonings, Mark knew he had to build a website and make these amazing Hawaiian flavors available for everyone to buy. The two met after work to figure out how people could “get the spice” online. As a result Mark decided to build a website and call it Get The Spice. He has been working to creating the amazing flavor filled website and wants you to visit and taste the flavors. Check out Get The Spice and make 2019 the year of the spice and seasoning.